Parade Main Stage is located next to Generations Plaza at Idaho and Main Street. The parade viewing area in on Main Street from City Hall at Broadway to Carlton Street and downtown on 2nd Street. Viewing is discouraged from Franklin Road to Ada. There are lots of places inside the downtown core that provide a safe, festive viewing spot. Idaho Avenue will be closed from Meridian Road to Main Street from Noon -10pm. Main Street will be closed from the split corridor to Carlton Street from 4pm- 8:30pm. 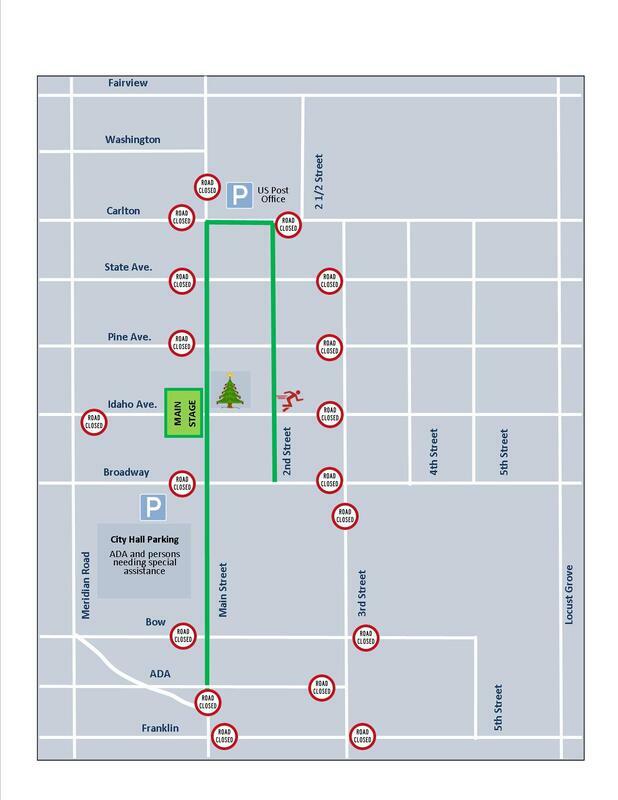 After the parade the Main Street closure will be reduced affecting only the area from Broadway to Pine until 10pm. Franklin will be closed from Stratford to Meridian Road from 4pm - 8:30pm. Traffic may be slow and delayed at I-84 exit onto Meridian Road heading north and on Franklin Road during the fun run and parade from 6:20pm - 8:30pm. 3rd Street will be closed from Broadway to Franklin from 7pm - 8:30pm. ADA Parking - City Hall Parking Lots / Accessible Off Meridian Road.